Got leftover chicken? 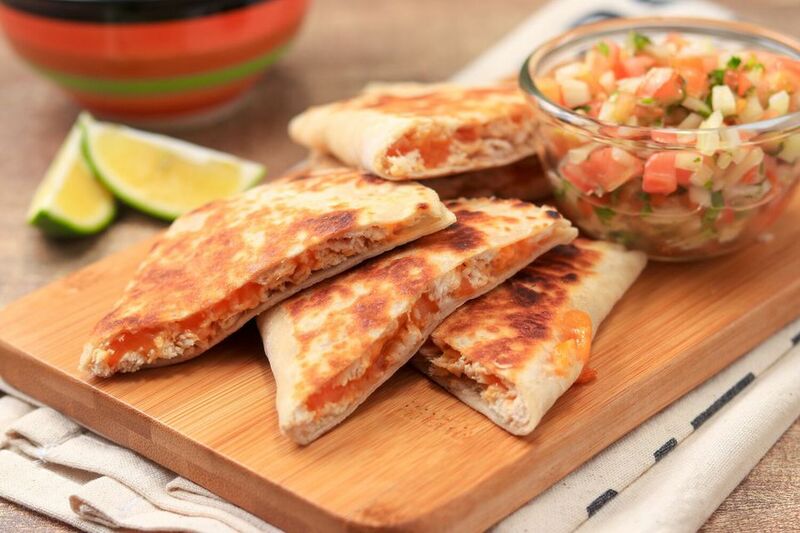 Try making these super easy chicken quesadillas. With just four ingredients, this chicken quesadillas recipe is a snap to prepare. Heat 1 teaspoon of the oil in a large frying pan over medium heat. While the pan is heating, assemble the quesadillas. Sprinkle 1/2 cup of chicken over half of each tortilla. Top with 1/2 cup of cheese. Fold in half and place one quesadilla at a time in the skillet. Let it cook 2 minutes until golden brown on one side. Flip with tongs or a spatula and cook another 2 minutes until cheese is melted and the quesadilla is brown on the other side. Remove to a plate. Repeat with remaining quesadillas. Then serve immediately. Serve these chicken quesadillas with tomato salsa, sour cream, and guacamole for a heartier version.